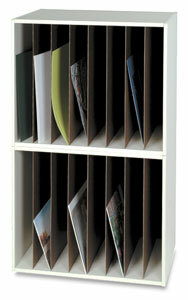 Safco's Art Rack vertically stores and protects over-sized layouts, original art, mechanicals, and keylines. Upright materials resist warping and are easier to find than stacked or shelved materials. Tempered hardwood dividers create eight, 4¼" wide compartments. It has channels for labeling, top and bottom, allowing you to identify the contents of each storage compartment. 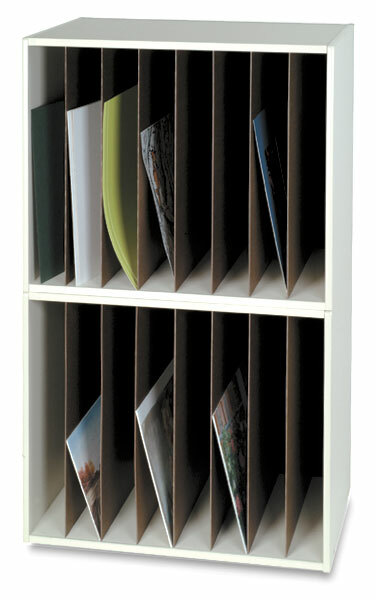 The Art Rack has an attractive, putty-textured vinyl laminate finish. Racks can be stacked vertically, used side-by-side, or used alone. Constructed of a strong wood-core product, the brawny racks easily hold hundreds of pounds of materials. To view a PDF of the Safco Warranty Statement, please click here.